Many of us are always on the lookout for new ways to boost our productivity. We have long lists of things we “should” be doing — there’s always another habit to take up, another activity to fit into our schedule. When we shift from one task or activity to another, we often try to focus our attention by sheer force of will. Our phone is still at our fingertips, notifications chime in at regular intervals, and our favorite distractions are just a few taps away. Broken down moment to moment, there’s little time in a given day when I’m not juggling various claims for my attention. In the morning, I check my email and other notifications while getting dressed and making coffee. On my commute, I listen to music or podcasts. When I get to work, I bounce between tasks, responding to emails, talking with co-workers, getting more coffee, and taking the occasional social media break. Even waiting in a short line compels me to pull out my phone, and when I cook dinner, I’ll put Netflix on in the background. Sometimes I’ll do two things at once as though I can focus on both of them — like watching TV while browsing Facebook — knowing full well I’ll just end up missing half of both. The fact that any of us can be productive at all in this kind of environment is a testament to our ability to selectively apply our focus. But if every moment of every day is full of stimuli demanding attention, it becomes increasingly hard to decide what requires conscious awareness. Our environments are nearly always noisy and bustling, so it’s much harder for our brains to tell what to focus on. To investigate this problem, two researchers from Boston University and Stanford University examined how and when we shift our mode of thinking. They propose a model of cognitive processing with two primary functions: habits of mind and active thinking. The former includes habitual tasks we can accomplish while letting our minds wander, like getting dressed or driving to work. At times, we may not fully remember what we did in these moments because we’re directing our attention elsewhere. The latter mode, active thinking, involves tasks that require more conscious engagement each step of the way. These activities necessitate little to no distractions; when we’re fully engaged in them, we can work for hours with little else crossing our minds. The researchers explored how switching between these two modes plays into the “success” of our powers of thought. They theorize that the “effectiveness” of our cognitive processes “may be as much a function of [our] capacity to sense when a switch is appropriate, as to process in one or another mode.” This means that improving your ability to switch between habits of mind and active thinking at the right moment can improve your mental capacity. The illustration above crudely demonstrates how we might switch between these modes. Essentially, your mind comes to recognize markers that signify when one mode of thinking is most advantageous — the more distinct the markers, the easier they are to recognize. But if you blur the line between conditions for switching to a “conscious mode” and conditions for switching to an “automatic mode,” your effectiveness will diminish. You will no longer be able to quickly tell when to engage in each mode of thought. 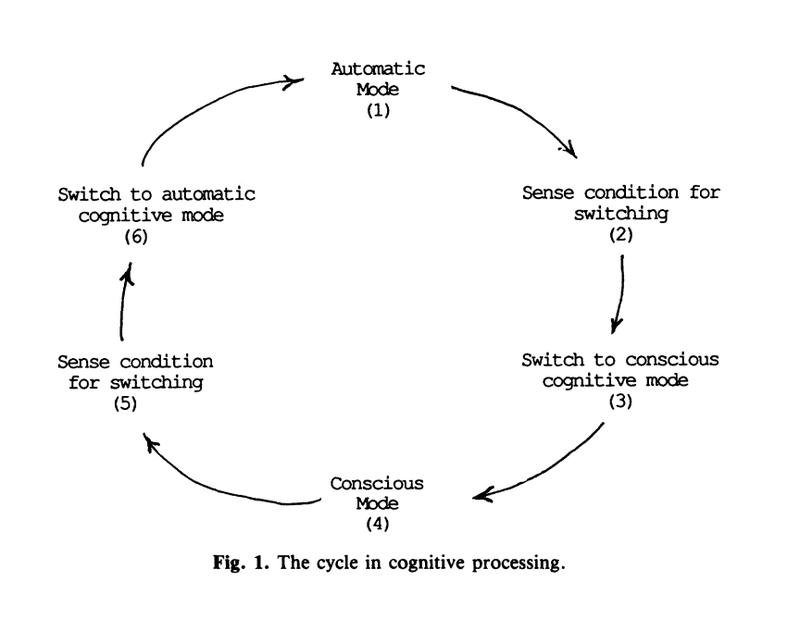 By simultaneously watching TV while cooking dinner — instead of switching to an automatic mode when I’m cutting an onion and switching back to a conscious mode when I’m following the next step of a recipe — I’m essentially trying to override this cycle in cognitive processing. I’m trying to cut out these automatic modes and rapidly switch between conscious focuses of attention. Rather than succeeding, however, I end up creating a sensory environment that overwhelms my ability to pay close attention to one thing at a time. Modern technology rarely allows us to be alone with our thoughts. For the vast, vast majority of human existence, the average person’s daily life involved large swaths of unmitigated monotony wherein any sudden movement, flashing lights, or loud noise was an immediate call to attention. Clear and direct cues let us know when to switch between these different modes of thought. Today, when we consume novel information about our noisy, bustling environments every day, it’s much harder for our brains to know what to focus on. If you’re only ever exposing yourself to interesting information, if you’re only ever exposing yourself to the stimuli, but not taking the time to actually think about it — to process it, to look at it from different angles, to try to run it against other paradigms or structures you have in your current mental schema — if you don’t do that work of just being alone with your own thoughts, you’re probably extracting just a small fraction of the potential value. Given the ubiquity of mind wandering, it’s evident that if we don’t give our mind the time it needs to freely wander, it will learn to find that time on its own. It would be an impossible task to stop ourselves from ever drifting from the present moment, so we must minimize the costs and maximize the benefits. Fostering mind wandering during non-demanding conditions helps us stay focused when we really need to. We’re not giving ourselves time to reflect on the past or to consider the future. Another set of researchers provide a somewhat deeper analysis of our thought patterns. In many ways, their conclusions are similar to those discussed earlier, but their analysis moves beyond the mode of processing to describe the content of our thoughts themselves. 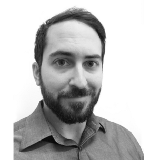 Broadly, the researchers find, our thoughts are of two types: focused, goal-directed thought (such as planning a trip), or undirected and spontaneous thought (such as a drifting mind during a boring presentation). The internally directed cognitions that typically process the past and the future are generally unfocused and random; sometimes, they’re labeled mind wandering. Society teaches us we should always be focused and goal-directed, but that leaves no room for much needed spontaneous thinking. If we’re always focused on the immediate needs of the present moment, we’re not giving ourselves time to reflect on what happened in the past or to consider what might happen in the future. The good news is that no matter what you do, your mind will still wander. The bad news is that it may be doing so at the expense of your conscious efforts to focus. After all, as the researchers note, “mind wandering occupies up to a third to half of the awake time in healthy adults.” That’s why even when I’m chopping onions and watching Netflix, my mind is elsewhere half the time. If your mind is finding moments to wander when your intent is to focus on a podcast, show, or article, then there’s little to differentiate between which activities need your complete attention and which ones don’t. When I’m simply dicing an onion, those conditional markers — the situations that prompt us to switch between automatic and conscious processing — are clear-cut. My focused attention or conscious decision-making is not required, only the muscle memory related to chopping, so my brain knows it’s an appropriate time for mind wandering. By contrast, if I present myself with continued, multiplicitous demands for my attention — a podcast on the train, a Netflix show while chopping onions — my brain has to learn how to navigate this sea of distractions while finding time for the mind wandering it needs. It’s liable to make mistakes along the way. Mind wandering can help develop your goals. Not only will giving yourself the time and space to essentially daydream increase your ability to focus when you need to, the processing done during this time will help refine what it is you should be doing and focusing on. One study out of the York Neuroimaging Centre looked at the relationship between mind wandering and the development of personal goals. The participants were first measured in a state of spontaneous thought and were then split into two groups. One group described TV programs, the other outlined their own personal goals. Afterward, the two groups repeated the process: The content and form of their spontaneous thoughts were measured followed by the same writing prompt. The researchers were looking for any correlation between the nature and content of mind wandering and the refinement of future plans. They found that “participants who developed more concrete goals had engaged in greater spontaneous future thinking between describing their goals for the first time and re-describing them,” while no such pattern was observed in the description of TV programs. In other words, the more time they spent daydreaming about the future, the more their personal goals evolved and became more specific between the two writing sessions. Many of us do our best thinking in the shower — one of the few moments of modern life where we’re mostly just staring at a wall. Taking care of things in the moment, as they’re happening, requires conscious awareness and focused attention. Planning for the future, however, appears to require several subconscious processes which work to develop and refine our personal goals during seemingly meandering patterns of thought. In this context of brain processing, it’s clear why many of us do our best thinking in the shower. It’s one of the few moments of modern life where we’re mostly just staring at a wall for five to 10 minutes. These moments of automatic thinking, where our minds drift off from the present moment, are powerful forces for creativity. 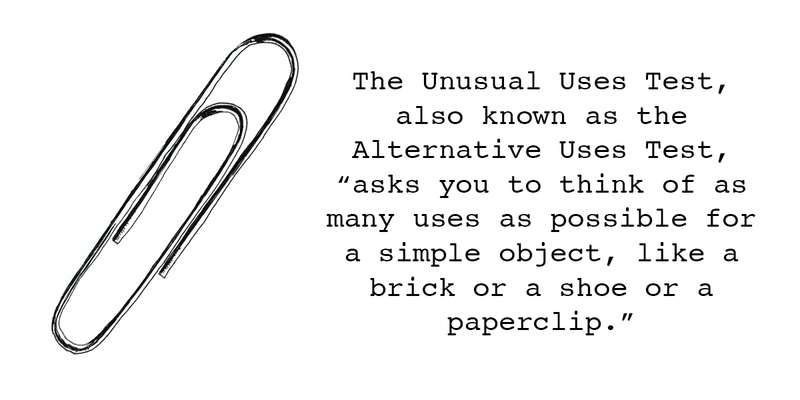 A study demonstrating this, sponsored by the University of California, tested participants on “the Unusual Uses Task, a classic and widely used measure of divergent thinking.” It asks that, in a set amount of time, the tester come up with as many unusual uses as they can for an ordinary object, like a paperclip. Read more about the history of the test and its uses here. After completing the test, participants were assigned to one of four conditions: 1) demanding task, 2) undemanding task, 3) rest, and 4) no break. In the first three conditions, the participants were given 12 minutes to either complete a cognitively demanding or undemanding task or simply wait, while the fourth group immediately went on to the final stage, which was to retake the Unusual Uses Task. The researchers were looking to see which, if any, group would make the most progress when being tested a second time. These automatic modes of thinking, when unleashed to their fullest extent, are powerful means of solving problems and coming up with novel solutions. Productivity usually comes down to a trade-off: Which tasks should you spend your limited time on? But giving yourself more space to let your mind wander doesn’t have to take any additional time out of your day. This last study also demonstrates that we often get the most out of mind wandering when we’re engaging in undemanding tasks. Our days are full of undemanding tasks, from making our bed to tying our shoes to driving to work to doing laundry to brushing our teeth. If you want to make the most of these moments, the only thing required of you is to try not to fill them with distractions. Put down the phone or turn off the television. Give yourself a moment to zone out. Your mind will always wander off, and by fostering the quiet conditions that allow for it, your full attention will be stronger when you need it.